Can Refusing Medical Treat Decrease My Car Accident Claim? 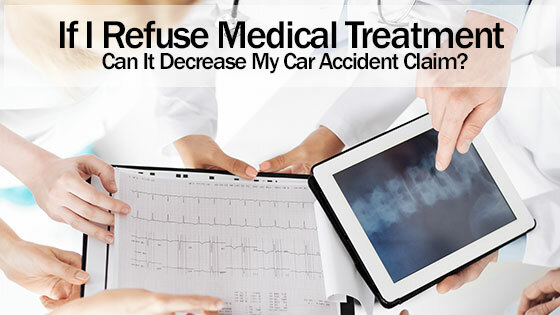 Home » Blog » If I Refuse Medical Treatment Can It Decrease My Car Accident Claim? If I Refuse Medical Treatment Can It Decrease My Car Accident Claim? It is not uncommon for an accident victim to think they are not injured at the time of a collision only to realize later that something is not right physically or mentally. Even mental anguish is claimable in certain circumstances associated with an accident, especially following very serious injuries. But, will delays in treatment for accident injuries reduce the value of a claim? For the most part no, but it could have an impact if the injured party does not seek medical treatment as soon as possible. You can count on any insurance company trying to use a delay in treatment as a part of their argument when it is time to settle an injury claim. All auto insurance companies look for every detail they can find to attempt denying or lessening the value of an injury settlement. That is why it is always imperative to retain an experienced and aggressive car accident attorney who is willing to fight for their clients. Every accident that results in injuries will be investigated by highway patrol authorities who will question all of those involved in as much as it is possible. Individuals who refuse medical treatment at the time of the investigation will more than likely have this information included in the official report. Understating that you are not injured could easily be a detail the insurance provider could use in negotiating a claim, but it is not necessarily an issue when the case goes to a hearing. The medical evidence supporting the injury claim has more weight. An experienced car accident attorney will have a comprehensive medical evidence filing that supports all injury claims. The important thing is to seek medical attention as soon as an accident injury is obvious. Delayed accident injuries can typically be reported and treated within 24 hours for the most part, but time spans following that could be an issue the insurance provider may attempt to use. However, it is not unusual for an injury to be reported after that, such as a back or neck injury. Both injury types can manifest later, and not always quickly. Injuries that appear as minor should always be reported during the investigation with the officer making note of the fact even though no medical treatment was requested at the scene. The ultimate concern is reporting to a medical treatment facility as soon as possible when the injury worsens, including seeking emergency treatment after standard primary doctor hours. All auto insurance companies evaluate claimants for contribution to their own injuries, including passengers. Drivers of all involved vehicles are routinely evaluated for contribution to causing an accident in the accident investigation, which means that claims can be reduced for those who are assigned any level of comparative negligence. The problem is that this is officially decided by a jury in a full trial, even though insurance claims adjusters will want to use an estimation during the settlement negotiation process. Even when an injured claimant has not realized their injuries until well after the fact, an experienced car accident attorney can still use the documented facts of medical treatment to pursue whole damages for all injuries associated with the mishap. Never fail to file an insurance claim when you have been injured in an accident in Texas. Call our law offices today at any of our convenient locations and get a free consultation.